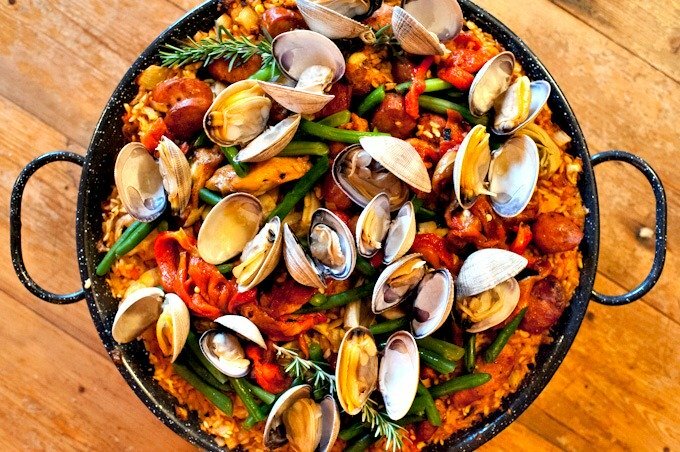 Catalans like to mix seafood and meats, which they call mar y montaña (sea and mountain), and this dish, a specialty of the Bajo Ampurdán area, in Girona Province north of Barcelona, is an excellent example of that tradition. 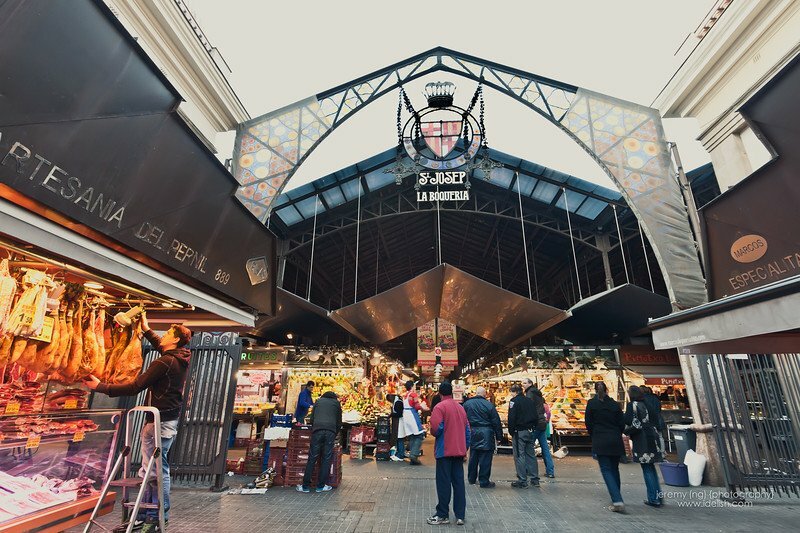 I first tasted it at Can Pep, a restaurant in the beautiful beach town of Calella de Palafrugell, and was immediately smitten. 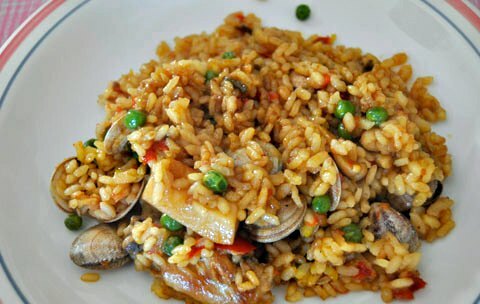 Like many other rice dishes from around the Mediterranean, this one is prepared in a cazuela, rather than in a paella pan. Meanwhile, in a large sauté pan, heat the olive oil over medium-high heat. Add the rabbit and brown, turning as needed, for about 10 minutes, or until golden on all sides. Using a slotted spoon, remove the rabbit and set aside. Decrease the heat to medium and add the onions, garlic, vermouth, water, salt, pepper, and sugar. Cook, stirring occasionally, for 20 minutes, or until the liquid has evaporated. Increase the heat to high and cook, stirring occasionally, for about 5 minutes longer, or until the onions are caramelized. Meanwhile, preheat the oven to 350 ° F. In a saucepan, bring the stock to a boil. Decrease the heat to maintain a simmer. When the onions are ready, add the tomatoes, pimentón, and saffron to the pan and mix well. Add the squid, decrease the heat to medium, and stir briefly to mix with the rest of the ingredients. Transfer the mixture to a large (about 15-inch) cazuela, place over high heat, add the rabbit and rice, and stir to combine. Pour in the hot stock and cook for 5 minutes without stirring. Drain the clams. Place the clams and the shrimp on top of the rice, and place the cazuela in the oven. Bake for 12 minutes. The liquid will be absorbed, the rice will be tender, the clams will have opened, and the shrimp will turn pink. Remove from the oven, cover with a lid or a kitchen towel, and let rest for 5 minutes before serving. Discard any clams that failed to open and serve.